Watching the live presentation I got a positive impression of how that works for complex applications and transactions correlating different abnormal events with possibility to reduce false positives situations. Interesting that the combination of dynamic and static thresholds are used there to generate alarms. Just like SEDS does - static one to capture hot issues (run-aways and leaks) and statistical ones for early warnings. Speaking about SEDS, I have decided to play with near-real time data to see how difficult would be to redesign SEDS making it works more similar with mentioned above modern and serious tools. Fortunately SEDS is just a bunch of SAS Marcos with parameters which helped me to make the adjustment needed to include today's data. And surprisingly that was pretty easy task! I spent only a couple days to developed a "real-time SEDS" prototype. Currently what it only does is building every hour the real-time Control Charts that can be seen at the beginning of this post. 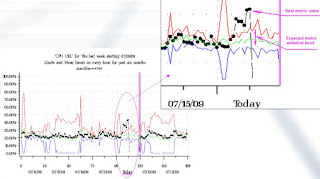 I plan to include some details about real-time Control Charts to my upcoming CMG'09 Workshop.